Local governments are increasing turning to the web as the key method of delivering information and resources to citizens. 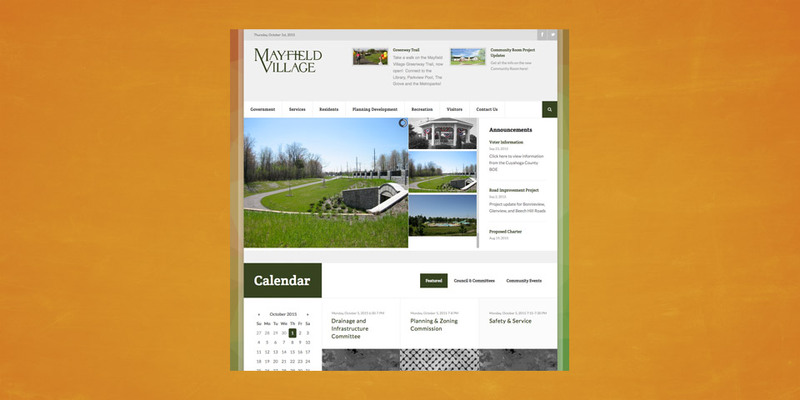 Mayfield Village wanted a site that highlighted its abundant parkland, first-class recreational facilities, a school system regularly recognized for excellence, and the burgeoning high-tech business opportunities in the commercial district. They selected Boom Creative to help deliver a cutting edge solution that was consistent, reliable and approachable. At Boom Creative, we can work with all types of content management systems and vendors. If your budget does not allow for a CMS, we can develop simple templates and solutions to allow your internal team to manage the site.